After fighting one of the hardest battles that we ever fought in America, your son was not hurt in any way. It is true that we are defeated, and our army routed, but it was not the soldiers’ fault, for never did the soldiers fight harder, or bolder than those engaged in that battle. I think I tell the truth when I lay it to poor Generalship. I am sorry to say anything about or against our General Tyler, but I believe, and it is the belief of many, that he worked for the interest of the South instead of the North. That is a hard saying, but I feel so. If McClellan had conducted that noble army, I believe we would have routed them, although their number was greater than ours. I will say for the Maine boys, that they did nobly. The enemy were entrenched and behind the strongest batteries that could be made, and that stronghold which is just this side of Manassas was what we endeavored to take. I feel proud to think that I am a soldier of the Maine 2nd Regiment. They fought like tigers, and made one of the boldest and most daring charges that was ever made. They were twenty rods nearer the battery than any other Regiment. Now for a very short detail of our operations. At 1 o’clock Sunday morning we left our encampment at Centerville and moved on. We then halted and let every Brigade pass us. Our Brigade consisted of three Connecticut and the Maine 2nd under Colonel Keyes, a U.S. Officer. But soon the order came to advance without any load except cartridges and belts. We stripped for the fight, and marched onward. We soon came into Sherman’s battery which was throwing ball and shell at a rapid rate. We then moved onward “Double Quick” for two miles. It was at that moment that we ascertained why we were kept in the rear. It was to be fresh for the boldest attack. We came within a short distance of the battery when we formed in the line of battle under a small hill. 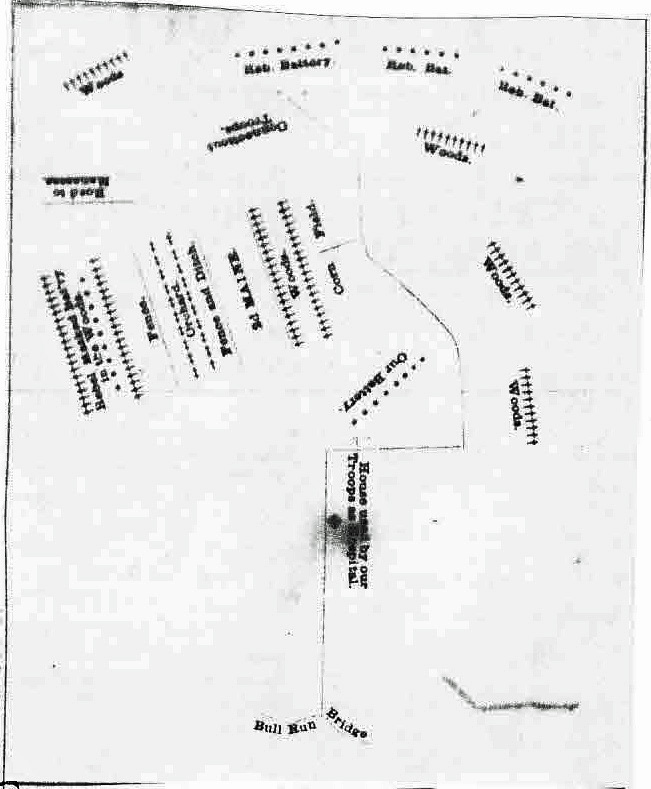 Maine boys attacked the front, and the Connecticut – each wing, and one Connecticut at reserve. The order came to forward march. Then came the order from our noble Colonel to forward guide center double quick march, Then came the tug of war. One howl passed along the line, and the bold boys of the 2nd Maine dashed forward like lightning, firing as fast as possible. Our men began to fall like hail stones, but that did not discourage them. They rushed onward and were led by the most gallant officer that ever fought. We were quite near the battery, from which came ball, shell, grape & chain shot, also rifle and musket. Balls flew like hail stones among us, with every volley taking its number of bold men, but still unflinchingly the Maine boys dashed onward, showing neither fear nor cowardice. But our Brigadier General soon saw that the enemy was too strong for us. He rode to the left wing and gave the order to fall back to the woods on our left. This was our third charge, he gave the order twice before our heroic Major gave it to his men. I was on the right of the left wing, but when they turned toward the woods, I looked about. I beheld the Stars and Stripes and my beloved Colonel on the right. I said to myself – I never will leave that flag unprotected. I rushed for it, leaving my company there. I found our Colonel cheering his men he himself in advance of them all. Oh, Father, words are inadequate to express my love for the Patriotic hero, he deserves the praise of every living being in Maine, oh yes, and the U.S. There he stood like one that knew not fear. He dashed on with the remainder of the Regiment, and went very near the battery. Had we been reinforced at that moment, the battery would have been ours, but was then impossible. I rushed to the Colonel’s side. He said: “Has the left wing of my Regiment fled?” I then told him how bravely they fought, and how they received orders twice from Colonel Keys before they fell back. A smile then lit up his countenance. He then drew his men together and fell back to the road which formed a breastwork for us. Our brigade was divided about 200 rods apart. All of the Connecticut Regiment, and the left wing of ours on the left, and the right wing of ours on the right, and not an officer of either part knew where the other was. The Colonel came to me and asked if I knew anything about the remainder, and it happened that I was the only one there that did know. He asked me if I could go and deliver a message to Colonel Keys. I knew what a dangerous undertaking, but of course your son said yes, and while the others lay concealed, I seized my gun, and rushed by the very cannon’s mouth for 100 rods without any shelter. When I came to the middle of the field, the cannon and musket balls flew all around me. I don’t see what saved me. Three cannon balls struck within three feet of me, and the rifle balls whizzed by me like a swarm of bees. It seemed to me that they saw me, and knew my errand. I neither paused, nor looked around, but dashed forward ’till I came to the left wing. The boys all cheered me as I went by. The Connecticut officers ordered me to lie down. They said I was exposing their whole Regiment. I said to them, “I know my business, and shall perform my duty.” I dashed along to the left of their line. There I found the Commanding officer, and delivered my message. He cheered me, and gave me orders for Colonel Jameson, but would not let me go back as I came, but told me to go down a ravine and through a piece of woods. I asked him twice to let me go as I came, but he wouldn’t consent for he said he didn’t want me to get killed. I soon found the Colonel who was watching for me. He waved his hand when I came in sight. I sprang forward, and was soon at his side. I felt proud to think that I had done him a little good. The officers rushed to me as if I was a lion. The Colonel then ordered his men to follow him, and me to act as a guide. I led them around through the same ravine. Many of them said I must be going wrong, but the Colonel ordered them to follow. I ran ahead ’till I came to the main body of our Brigade. I then jumped up on a fence and waved my cap until they came to me. Then they found that I had led them just right. I then reported myself to the General. He ordered me to fall back and rest, for he saw that I was nearly exhausted. I asked him if I should not act my pleasure, and he said yes. Well, said I, I will be in the ranks in ten minutes. He smiled, and I turned away. I got some water, and wet my head and drank a little, seized my gun, and fell in my place. I feel that I did my whole duty, and my officers give me praise. Our Regiment was cut up badly. I think half or more of those noble boys are gone. There appear to be but a handful of them left. Our Regiment retreated in fair order, but this whole Army was broken up. There were too many for us, as we were led by our General. But we will wipe them out yet. In retreat we marched 32 miles, and I am very weary, but I stand it finely. I am ready to try them again any moment. “By the eternal” I will fight them until they recognize the Constitution of the U.S.
Our Regiment is so broken up that it will take some time to recruit. Our Captain was injured, while crossing a bridge in the retreat, across the chest. I led him along until I found a baggage wagon. Then I put him into it, and stuck by him all night. He was very grateful to me for my kindness. When morning came, I secured a horse for him, and guarded him until he was safely landed in this place. One of our Corporals is probably dead, and another wounded, and about half of our Company are gone. It is hard, but then it is honorable to die for one’s country. All of our Field Officers are living. One or two Captains and several Lieutenants were killed or wounded. Some taken prisoners. I think our Chaplain and Surgeon are in the hands of the enemy, besides many others. I had no fear at any time. I was greatly excited and willing to do anything. I do not think there was a coward in the whole Regiment. We brought off all our flags in good shape. The bearer of the largest one was the first man shot. I saw Major Nickerson yesterday, also Colonel Marshall and Captain Cunningham. They are all well, and send their regards to you. Captain Bean and Lieutenant Bird of the Brook Company were slightly wounded. Captain Sherwood was wounded in the arm, may lose it. Lieutenant Walker is all right. He behaved nobly, so say his men. I am going to see him soon. Mark Dodge and Daniel Nickerson are both well. Our Officers all behaved like patriotic heroes, and deserve the praise of all of Maine. Maine need not feel ashamed of her officers or men, for no others fought more bravely but the 2nd Regiment is ahead of all the others. No man behaved more heroic that Lieutenant Garnsey of our Company. I have not time to write more. Excuse the composition, spelling and writing, for I am so hasty that I think I have left out about half. Letter from the Second Regiment. Arlington Heights, Va. near Fort Corcoran, July 27th. After a disastrous battle, and an ignominious retreat, although the 2d Maine strictly obeyed orders, and nobly performed the duty assigned them, as the official report will testify, I embrace the present opportunity to once more resume our correspondence. Our regiment, before the conflict, having been attached to Col. Keyes’s brigade and Gen. Tyler’s division were held as a reserve guard, until arriving at the scene of action, when suddenly the reserve was dispensed with, and we were literally run two miles and plunged into a masked battery, with the fond assurance that success was certain, and the day our own. After the first charge, however, we were fully convinced that we reckoned without our host, and that we had aroused more passengers than we imagined the infernal machine contained. Upon the second charge we did splendidly, sending many a misguided Southron to his long home, and for a moment the enemy’s lines apparently receding, we felt quite inspired. At this juncture, the battery still belching forth its torrent of iron hail, we were ordered o retire, which we did in good order, and having sheltered ourselves in the woods near by, we then attempted to take the monster by a flank movement, which possibly might have been crowned with success, ,had more despatch been exercised. Our boys fell in lively, but the 1st and 2d Connecticut regiments seemed to prefer a recumbent position. Receiving the order to advance, we were repulsed, without loss, a third time, the enemy, on account of our delay, having anticipated the attack. Failing in this, our last attempt, amid shells rifle cannon and Minnie rifle balls we retired from Bull’s or Bloody Run, feeling that without avail, we had nevertheless nobly performed the task assigned us. Would to Heaven we could tell a different tale. In our first charge, Capt. James of Co. C fell mortally wounded, while bravely leading on his command. At the same fire, Wm. 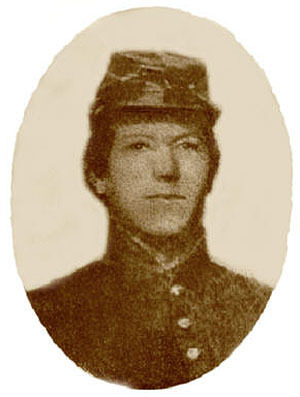 J. Deane, color bearer, fell wounded fatally while vigorously sustaining the flag presented to is the day before by the ladies of California formerly residing in Maine. This flag was for a short time lost, but finally regained. The flags presented at Bangor and New York are badly riddled, but will again, I trust, lead us on, not to defeat but victory. Color Sergeant Moore, I forgot to add, was also shot dead on the first charge, the aim of the enemy being directed to the glorious Stars and Stripes under which they heretofore received unnumbered benefits and unbounded protection. In returning from the field it fell to my lot to see and grasp by the hand both Capt. Jones and Sergt. Deane – the former being borne to the hospital by his comrades in arms and the latter already there under the care of Dr. Allen and Lieut. Skinner, who have since been taken prisoners. Dr. Palmer desired to remain at the hospital but Dr. Allen insisted that he should move on. Capt. Jones, receiving a ball through the spine, will probably never recover. Sergt. Deane, being apparently wounded thro the wind-pipe, his case was considered doubtful. By the way, to give you a specimen of Southern chivalry, so much in vogue. While our Surgeons were amputating limbs and extracting lead from our wounded and dying, the valiant “Black Horse Cavalry”, so called, charged upon the hospital and all were taken prisoners – but owing to a galling fire from our ranks, they were unable to hold their position and with great loss and few prisoners rushed their steeds into the woods beyond. I live in the hope that our regimental loss in killed, wounded and missing will not exceed one hundred, but the death or absence of even one brave fellow from our ranks is too much, when we reflect that apparently nothing has been gained by the struggle. Our regiment and all others would have been literally cut to pieces were it not, after the first fire, for the order to lay down and reload, by so doing the enemy’s fire, most of the time, was too high, and passed harmlessly over us. By the way, Washington Harlow, of company C, reported wounded and in hospital, is incorrect. He is wounded and missing. Samuel Nash, of company A, reported wounded, is with us, alive and well. Rev. Mr. Mines, our Chaplain and one of the bravest of clergymen, is taken prisoner – not shot as some affirm. I trust that as regards surgeons and chaplains at least, there may speedily be an exchange of prisoners. From all we can learn, Beauregard is inclined to deal justly with all and the acts of Indian barbarism that have been committed thus far are not through his orders. The loss of the enemy is far greater than ours, and from one of the 69th New York regiment who has made his escape I understand that Richmond is more a city of mourning than rejoicing. The truth is we gained the day, but, humiliating as it must be to us all, lost it through the incompetency of some, either officers or civilians, [?] the [?]. Among the distinguished busy-bodies on the field, there were too many Congressmen and reporters, and too few real commanding officers. But the die is cast and we must look hopefully to the future. Our brigade, which comprised three Connecticut regiments and a portion of the New York 8th, whose term of enlistment has about expired, is now broken up, and we are temporarily attached to Col. Sherman’s command – 3d Brigade. We soon hope, however, to again be under Col. Keyes, who is both a skilful, cautious and humane commander, and much esteemed by us all. Gen. Tyler, I must confess, we do not adore, but in the late engagement cannot say but that he obeyed, to the letter, the orders of his superiors in command. The whole movement was ill-timed, badly arranged, and horridly engineered, and my only wonder is, that we are not all laying upon the battlefield, under the [?] rays of a July sun. On Sunday evening, our regiment, having retired in good order to Centreville, we were assigned the honorable part of guarding for the night, the battery commanded by Captain Ayres, but at about ten, P. M., jaded and fatigued, the whole army was ordered to Fairfax, and our march was continued until we arrived at Alexandria, twenty-five miles distant. Could we have retained our position at Centreville, even now we should have been there, but fate ordered otherwise, and we now have a demoralized army, and a disgraceful flight to patch up as soon and as best we may. Our boys, owing to fatigue, ragged clothes, no money, &c., are not in the best of humor, as may be supposed, but with many promises ahead, and by the blessing of God, we soon hope to be in better circumstances, trusting that when we again move onward, we shall have a Commander-in Chief in whom we may have [?] confidence. One thing has been demonstrated – that infantry cannot cope with masked batteries, and that a successful retreat – if retreat we must – cannot be accomplished without sufficient artillery and cavalry. Time alone will heal the present shock, and to time must be left the [?]. The general health of our regiment is good, although our camping ground is not in a very healthy locality, as we are now obliged to occupy the old camping ground of the New York 69th, which , upon our arrival, was not troubled with extreme neatness. In a few days I hope to write you more in detail. The following letter received on Saturday will be found of much interest. The incidents of the charge made by the gallant Second are given in some detail. Comrades – We have received you generous donation, and wish, as far as words are able, to express to you our thanks. We did not, (as was you intention), receive it in season for the 4th of July, but it came to us at a time when of all others we most needed it…it came to us after the battle, when we were “war worn and weary.” It came just as we had returned from burying one of our comrades, (Chamberlain). We had been on our feet for thirty-six hours, had fought a hard battle, and marched in all a distance of sixty miles, soaked with rain, our clothes ragged, and some without shoes. If you could have seen the crowd that gathered around that box as it was opened, and could have heard the fervent “God bless the boys at home!” as the generous presents made their appearance, I know you would have been amply compensated! I will endeavor to tell you a little of the part we had in the affair, as I have not yet seen in correctly stated in the papers. In most accounts which I have seen the Second Maine is put down as the Second Wisconsin. We were in Col. Keyes’ brigade with the three Connecticut regiments, and in Gen. Tyler’s division. We [?] our camp at 2 o’clock Sunday morning, the 21st, at Centreville, when we were halted while the whole column marched past us, leaving us in the rear as a reserve. About 10 o’clock the order came for us to march to the front, which we did, coming up to the point where Sherman’s battery was engaging one of the rebel batteries. Here we threw off our coats and packs, and marched by the right flank in double quick time through the woods, across fields, over streams and ditches, a distance of over three miles, coming up to the enemy’s battery on the flank, coming on right line we charged the battery up a steep hill. The battery had just been reinforced by the arrival of Gen. Johnston’s fresh troops, and as we charged up the hill, a storm of iron and lead came down upon us, which nothing but the overruling hand of God prevented from sweeping us from the face of the earth. Twice we charged almost to the muzzles of their cannon, and twice we were driven back, when the order came to retreat. William Deane was among the first who fell, carrying the California flag which had been presented to us the day before. We got him on board an ambulance of the New York 69th, and I suppose he fell into the hands of the enemy. John F. Reed was taken prisoner in the cavalry charge, and Edward R. Chamberlain of Bangor, died of exhaustion, two days after reaching Alexandria. This is the whole loss of the B. L. I. On the retreat, shot and shell flew thick and fast amongst us, but fortunately none of us were hurt. The enemy’s cavalry made a dashing charge upon our rear, but we formed the best lines we could, and kept them at bay. At Centreville, we dropped on the ground for a few minutes to rest, when the order came to retreat to Fairfax, and once more we took up our weary line of march, retreating a distance of 28 miles, without food or rest, the last three or four hours through a heavy rain, till we reached Alexandria. We stopped two days in Alexandria, and were then ordered to this place. Poor Chamberlain died the day after we left Alexandria, and it was while Capt. Bartlett was there making arrangements for his funeral, that the long looked for box was found in the Alexandria express office. You can perhaps imagine something of our feelings upon receiving it. All I can say to B. C. Frost, Levi March, John Lowell, C. C. Prescott, H. E. Sellers, H. G. Thaxter, O. R. Patch, and all others who contributed in making “our box”, is, that a soldier’s blessing will follow you. *B. L. I. – Bangor Light Infantry, Company A of the 2nd Maine Infantry Regiment. Go here for an article on the colors and color guard of the 2nd Maine at Bull Run. Hat tip to Robert Moore.